This week has been both busy and inspirational... I felt lost and focused at the same time... one of those oxymoron's in life. While I was working on my exercise, I had let other things slide. Part of me kept thinking I should and could keep up with everything I need to do... don't other people do this? I must be prioritizing wrong, maybe if I just sat down and made a plan? Each time I would try to do this, something else would pop up. What I ended up figuring out... which I have always known, was that I have no need to keep up with others, just because I think I should. When I try to keep up, being the best housekeeper, being the best blogger, doing the most exercise... on and on... I end up not being good at anything. I end up zoning out and throwing the towel in and figuring I will do it all tomorrow. I am not everyone else, I am not here to show that everything is perfect, nothing is perfect... everything is work which is fine. I am not trying to show anyone that you can have it all, I think we all have to make choices, ones that are good for us. For me at the moment, exercising, getting healthy and becoming strong are at the top of my list... 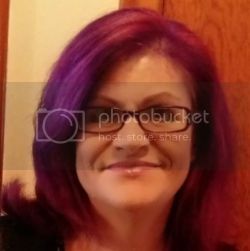 I don't want to look back in a year and say, darn, I wish I had started then... do you see that I didn't write about how I wanted to lose weight? I have weight I want to lose but that is not top priority, I believe if I get healthy, become strong and exercise, the weight will work itself out. Another thing that is important to me of course is being a good mother, I haven't always been one, due to depression in my life... I can tell you that when depression happens to you, you can never understand how difficult it is to function, let alone be a good mother. I have been at the point that I have done the bare necessities... luckily for me I have had very good people in my life that have stepped up and helped me, instead of judging me. I think we all need to remember this as many of us are dealing with much more than any of us are aware of. The third most important thing to me is getting myself right spiritually... this is not for everyone but it is for me, it helps me to balance my life out... when I am not working on my spiritual side, I am floundering constantly... I am doing things that ultimately make me unhappy which then lead me into a more difficult cycle... it is like I have no purpose. It isn't that life becomes simple as that would be a joke because when I decided to work on that part of my life, everything and I mean everything came crashing in around me... but I knew that was a part of my journey. I think each of us has to decide what is important to them and not worry about what is important to others... our journey is going to be different than other people and there is nothing wrong with that. What is important is our journey and what we learn along the way... Mine is and has been bumpy and I may not have always enjoyed every second of it but I can say I am happy to be on that journey. All the twists and turns I have made, have brought me to where I am today and made me a kinder and more compassionate person. I'd like to think that I would ask "Why?" right back. It's not for anyone else to judge what should or would make you happy. I love your "If I get healthy and strong" statement. That's a wonderful way to look at it - the weight will work itself out. The best advise I ever got is 'I am not in competition with anybody, push yourself, go at your own pace, constantly upgrade yourself and be content'. We are all here for different reasons why would I want to pith myself against someone on a totally different journey? The demands of everyday life can overwhelm certainly and just when you think something is completed to your satisfaction, many more demands pop in its place to work on. Prioritization and turning off all the "noise" - TV, others negativity, your own ridiculous standards, etc. Love how you keep it real, Launna! love how your blog looks now! have a fantastic week! As they say..one day at a time. I know..I try to look back on the day and see just what did I do. To some..I'm sure its not enough. But like you..I think taking care of you is the most important thing we can do. And of course, we do want to reach out to others. But ..everyday is an adventure..and well..I seldom ever have a real plan. All the best. Loved the post! I do feel your pain and your frustrations! I constantly ask myself why I can't keep my house and yard as perfect as others do. Why can't I cook the same marvelous meals they do, volunteer at school all day, clean the house spotless and still have every hair in place? Some mornings I find myself working around the house and worrying that I am behind and just repeating over and over again -- I am doing the best that I can. Why can't that be good enough? I needed to read this today. Thank you! Of-course we have to make choices that are good for us if not who else will do? It is always smart to be happy on the journey you are if not one would be miserable all the time. So true, appreciate and learn as we go along. The past makes us stronger and wiser on moving forward. and thanks for your lovely comment, I am so enjoying the string lights, I have tons of pinterest inspiration on them but finally bit the bullet and did it! I did find a way to use my tray for now, I put my glass bottle, candles, and perfumes into it! Its gorgeous. Today I'm in love with the beautiful quotes that you posted.I think it's very important to make positive choices for ourselves. Such a meaningful post and that is what I love about you my dear friend. When I get time later in the week I'll email you, could really do with a friend right now. Every day's a school day. Thank you very much for your comment, I edited the post again and I added other pic. I don't know if you would like to check it again. I am going to print your post and read it at home. I don't have internet at home right now. I don't think there's anything wrong with wanting to find the love of your life...it's natural to want a partner, someone to share the good and bad times with. It just isn't always easy to find. You are so right, we need to listen to OURSELVES, not others. But it's so hard though... I keep trying to make others happy and live up to their expectations when it's really ME I should be thinking of. You definitely have to prioritize. I have found that I can manage a great deal by building good habits one at a time and carving out a schedule/routine that maintains those habits. Granted, things happen and the entire system fails periodically, but that's life. It's all about starting where you are and building upward, no matter how far you slide, right? Sometimes when trying to the best at everything, I realize I am not giving one single thing my full attention and nothing is actually "the best". Prioritizing helps me! If I want to work on being a better friend, I need to take a step away from my blog for a night to have a girls night out or meet for happy hour. Time management is key and definitely helps! Dear Luanna, I think that is normal for everyone to get the best result soon after starting something, but often this is really impossible! You are you and can grow every day if you are concentrate on yourself and your goals, doing yur best avery day until you get them! "being the best housekeeper, being the best blogger, doing the most exercise... on and on... I end up not being good at anything. I end up zoning out and throwing the towel in and figuring I will do it all tomorrow. I am not everyone else, I am not here to show that everything is perfect, nothing is perfect..." I feel you, I know how it is when I start many project and finished just few. I can totally connect to this post of yours ! I too keep postponing so many things for tomorrow! And my my I had no idea you were a mother ! Not to forget the depression part which is the worst of all! God bless you and I hope you keep up with the good things you have started in your life! I wish you an amazing evening! oh, where to start? first of all, try to get rid of the word 'should' and try to replace it with 'could' or 'might'. don't be so hard on yourself. you shouldn't be or do anything else than what you are doing or who you are right this moment. I truly believe we all do exactly what we can at any given moment. that doesn't mean there isn't room for improvement. but negative self-talk is not the way. or comparing yourself to others. but I'm sure you know that. Great post, Lauanna! I am not a procrastinator by nature...I am organized and like to get things done as soon as I can; however, when depression strikes me, I even put my eating on hold, sometimes only eating one meal, and this is not good! Thank you so much for sharing. It was great to read your thoughts today because I can relate to what you are talking about in following your own journey. Society places so many ideas in our heads about who and what we should do with our lives. I made a decision not to live by the standards of others and do what makes me happy. Even after I made that decision, it's something that I must constantly remind myself of. There will always be those who have things that we want in our lives, and you may have things that others admire about you. Reminding myself that nothing is perfect, and focusing on being thankful has also helped me do better emotinally, physically, and mentally. I hope that you will stay focused on your goals and what really makes you feel good about yourself. As long as we're alive we keep on learning. I love your positive post, My dear friend! The first quote is great, you always inspiring me! Wishing you an adorable day my sweet Launna. I think our goals and wants change over the years. What once is so desirable can become meaningless in the passage of time? Dear Launna, you are such a good person. Life is very hard and sometimes we don't know what we really want. I hope you are much happier now than years ago. Have a wonderful day! Nice quotes. I always find your posts so inspirational. You're lucky to have that support group. That's totally a gift in itself. Sounds like you're on the right road to doing what's best for you. I don't compare myself to others because like you said, who knows what part of the journey they're on...it's like comparing apples and oranges (both of which are great, by the way). ;) Have a great rest of the week!! I'm trying to stay warm over here, the temps took a dip again and this morning we had a light brush of snow! I love the second quote. It's actually a mistake that I end up doing pretty often, comparing myself with others. I'm very sorry to hear that you've had to go through such rough times with depression, I'm glad you're doing better now! Those are all inspiring quotes! Depression is a tough thing to go through. I'm glad you're doing better. So well written Launna! I was just talking to my son about this today. It's the end of his Junior year in high school and he's very overwhelmed with all he has to do. I told him to prioritize what is most important each day, and let the other distractions fall away. Now if I could only take my own advice! so true Luanna, love your quotes! How difficult is to find the right partner! When you find he, he doesn't love you and he loves other. Sometimes you never find the right partner. We are willing to love with all our soul but when we didn't receive the same we start losing energy. We need to feel loved but that is very difficult sometimes. I wanted to have a partner and have children but I don't know what will happen, for now I live alone. Would it be good to be wonder woman or super woman? No - I'd rather be myself and have the ups and downs that life throws at us. We are only human after all ! Hi my lovely Launna. I needed and thank you for your an inspiration post today. I am the one who lost:) I am so lost, it has been such a tough time for me and my family here. we're moving and packing our house to house. I've been handling all kind of thing here myself while my husband heading to the north to work and take care of our house to be ready to move in. On top of my allergies, I am beyond overwhelmed. I've been trying on working of my next post for sponsorship but never got it done. I'm glad to hear you're doing fine on working of your exercise:). I love your today's quote, Take care yourself Launna while you can. I wish you a lovely weekend ahead! oxoxo! 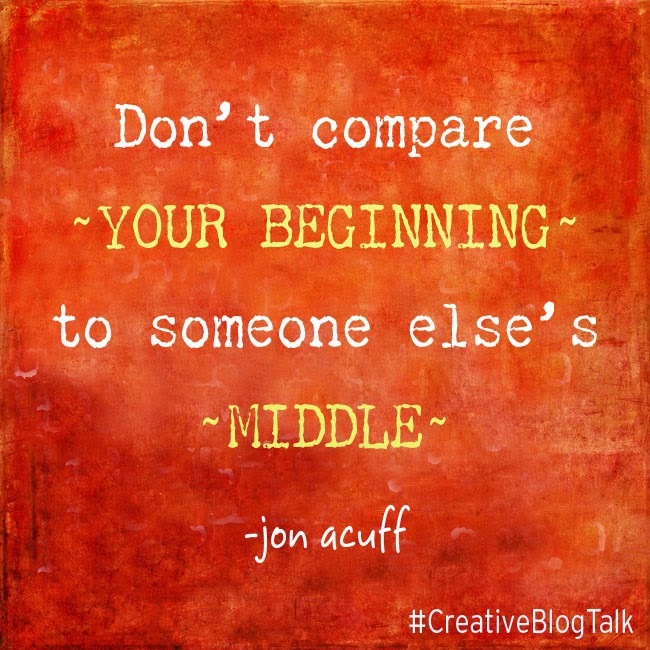 "Don't compare your beginning to someones middle" I love that quote! It's a great reminder. I think a lot of times we tend to compare out live which others which technically doesn't make any sense. Keep your head up Launna. I love everything you have said here, Launna, because it is sooo true! For me, the hard part is to not feel so insecure about myself when I see others achieving the same goals that I strive for, yet they seem to cross the finish line much faster than I. It;s easy to get frustrated and want to give up, but I have to keep reminding myself there is a reason for everything that happens and that maybe this just isn't my time yet for success in certain areas. I guess I have many more lessons to learn first! your quotes and words totally inspire me. Launna....YOU are an inspiration. Hugs from me to you. Stay strong and enjoy the journey. Launna, it is perfectly normal to be doing many things and not being good at them. I think those who manage to do well in both are really great but we and many others are not like that. It's good to focus and if you continue to want to do all then it would be great to do but not expect to be good at them. I don't know if you know what I mean. Maybe I would use an example. You know I'm also into exercise now right? I'm not good at them at all. I take baby steps and I don't follow through some of the difficult steps. I give myself a pat on the back that at least I'm doing them. Better than doing nothing. And of coz this exercising takes up time and then I'm behind at blogging stuff but I tell myself that at least I'm healthier and I do try to reply some comments here and there during few minutes of free time. Perhaps these are not really good examples though I hope it is clearer to you what I mean. I think you're doing great taking baby steps so do press on! Domingo abençoado para você e familia. Launna, this is a great post. I know what you mean about trying to keep up. I feel that way all the time like I'm trying to juggle all these things at once, and I always end up dropping something because I just can't do it all. A friend of mine tells me that "Comparison is the thief of joy," and that is so true. We each have to set our own priorities and live our own lives. 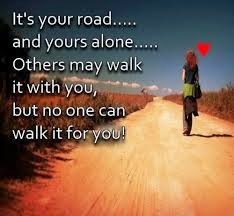 So, beautiful and inspiring quotes :) really we all have to chart and walk our own paths, nobody else can do that for us. So well-written Launna. I end up feeling so frustrated some days, wondering what my purpose in life is as I feel like I don't really excel at anything.. I end up feeling pretty sick and tired about life...but it is He who brings me back each time, to help me realize how truly blessed I am, how small my issues are in comparison to others. 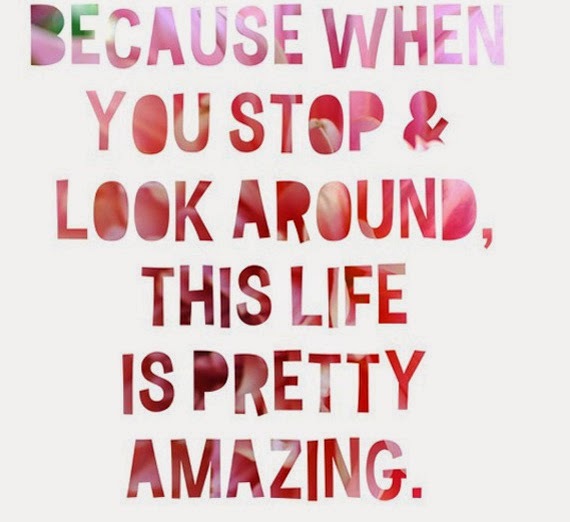 And when you think about it, despite the sad days and disappointments, there's so much wonder and beauty in the world. So many reasons to be happy to be alive. I am also on the spiritual journey. I want to draw closer to God...ever since I was little I've thought about how I try to be a good person, etc. but never in my life have I wanted to be closer with Him so badly.